Distant Kingdoms is in final editing, but was delayed to 5 May (and then to 12 May) by problems with the die cutter. SFB Module Omega Five will also be released on 12 May, as will Booster Pack 19 and Booster Pack 20. The new RPG Editing-Layout team (Jean Sexton and Mike Sparks) continues to work on Prime Directive d20Modern but are unable to give us a firm release date; they hope to have it by Origins. Captain's Log #37 is due for release on 2 June but may be delayed to Origins. We plan to release Federation Commander: Orion Attack on 23 June along with SFB Module X1R. Our Graphics Director, Matt Cooper, is moving on today to an exciting new job in motion graphics. We were blessed to have Matt as an intern from WTA&M University for the last 18 months and will miss him. Our project to build a new corporate headquarters continues to move on. We now own the land and are working with an architect to finalize the designs. View regular updates on this project. The Federation Commander Site and Forum continues to grow as more gamers find it. We have added a new section to the Forum called Web Requests. If you have any comments, questions, or requests for our Graphics Director, this is the place to let him know. This month’s Hot Topic is "FINAL STINGER PLAYTEST ROUND" which can be found in the General Discussion category. We have added a new Star Fleet Battles section to the forum to discus everything SFB. For new players, the Federation Commander Forum is a little easier to manage whereas the Legacy Discus BBS can be a bit overwhelming. Come see what the commotion is about and join the Federation Commander Forum now! Don't forget our original (discus-based) BBS where most product development takes place. The most active topics of late include: Farthest Stars campaign, Origins planning for SFB, and for F&E, and New Small Scale Combat for F&E. And if you really want to know what's going on, don't miss Steve Cole's daily weblog. In Federation Commander, speed is important but so is maneuverability. A captain who wants to go speed 24 has two options; plot a baseline speed of 24 or plot a baseline speed of 16 and use a point of acceleration each impulse. Café Press is an online marketplace that allows the Star Fleet Universe to produce unique products such as coffee mugs, t-shirts, tote bags, and more with the Star Fleet logos, cover art, and other artwork used for our products. We have added tons of new shirts, mugs, and other products. Want something you don’t see? Please contact Matt Cooper (Graphics Director) with your request. Visit our Star Fleet Café Press Store for a complete listing of the products available. The Kzintis should almost always at least consider armored drones of some kind when facing their traditional enemies in the General War era (Klingons and Lyrans). Click here to view this month's winner. "I am telling you, Commander, this ship is almost empty. It has little more than a skeleton crew," Korgan hissed into his communicator. "Get your marines over here now!" "Damn it, damn it, damn it!" yelled Santana. "Where the hell did that tractor come from? Helm, get us out of here!" "Arloh," said Arareem, "we will not make it. Before we can reach high warp, the destroyer will be upon us. We must prepare to fight him. Perhaps we can load another scatter pack? That maneuver against the frigate was brilliant." Michael C. Grafton asks: Can a ship on passive fire control (D19.0) accept lent ECM? Generate its own ECM? Follow-up question: Can a ship continue to generate ECM while a Wild Weasel is unvoided? QUESTION: The Gorns (706.3) and Lyrans (711.3) are limited to the production of one FCR per year. Does the Modular Heavy Destroyer rule (525.23R) mean they can get one more FCR equivalent HDW-FOP per turn in addition to that one FCR per year? ANSWER: Rule (525.23R) specifically says you can build one FOP in addition to your normal FCR, and can build another FOP in place of the regular FCR, so yes. QUESTION: The Gorns and Lyrans are limited to the production of one Heavy Fighter CV per year (see 530.223) in Advanced Operations until PF deployment. Does (525.23H) in Advanced Operations mean they can produce one more heavy fighter armed HDW-HOG per turn in addition to that limit? 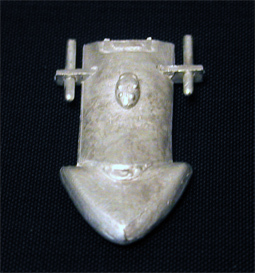 Few noticed that we had released this miniature of the Federation Express fast cargo ship, which is the fastest ship in the Star Fleet Universe. Saturday delivery costs extra.